This installment is a reaction to a post published in Life of an Architect by Dallas architect Bob Borson. Mr. Borson is the author of a very witty and insightful blog about his experiences in the field of Architecture, and as such he has become very popular on the Internet, receiving (it seems) a large amount of fan mail, in which sometimes the readers ask for advice. 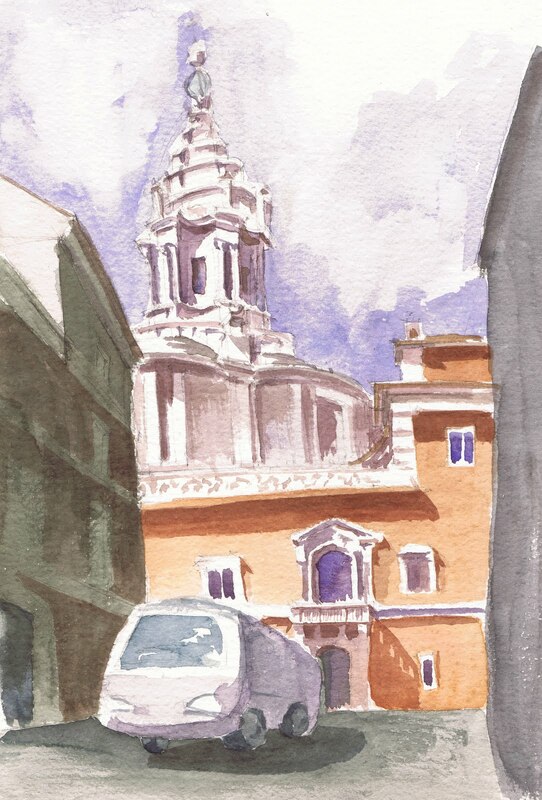 In his most recent post he addresses (one of) the questions that he is constantly posed: "How good do you need to be at drawing if you want to become an architect". Drawing after Bernini. Santa Maria Sopra Minerva. Rome, Italy. Pencil on Fabriano card stock. Nadia Palacios Lauterbach. Mr. Borson insists in his post that his drawings are really not extraordinary, but I would argue the contrary: Mr. Borson's drawings are elegant, precise, and economic, all desirable qualities in an architectural drawing. Mr. Borson's lines are drawn in one single stroke without hesitation, and finished with a sharp snap that denotes confidence in what is depicted and confidence in one's own hand; this confidence, elegance, precision, can only be acquired with rigorous practice and discipline, particularly if we are to believe Mr. Borson's claim that he is not endowed with innate artistic talent. I love to draw, so it will not come as a surprise that I think drawing is extremely important for the education of an architect. However, it is not my love of drawing that moves me to advocate for it, but my own education in it. I attended a school in which drawing was a daily occurrence. Students were judged on the quality of their lines as much as in the quality of their creations. Our examples were the wonderful plates created by students of the Ecole de Beaux Arts and the architects who won the Grand Prix de Rome; and though innate talent was not a requirement (as Mr. Borson notes), discipline and determination was a necessity if we wanted to live up to such high standards. Student work. Pencil and Watercolor on card stock. Nadia Palacios Lauterbach. The School of Architecture at the University of Notre Dame is a unique place, and in the many years since I received my degree I have come to realize that the skills I learned under the Dome are also unique and rare. The daily discipline of drawing taught me to see the world in a different way. When I take a photograph of something I like I may preserve its likeness for posterity but I learn nothing in the process; when instead I draw a subject from life I am forced to observe it, to analyze it, to become intimately acquainted with it, and to learn from it. After Michelangelo's "Lo Schiavo Morente" Musee du Louvre. Paris, France. Ink on paper with white chalk. The purpose of this discipline, as drawing is, is not to create a work of art but to exercise my brain, to engage it in that most difficult of activities which is to understand what one sees and guide one's hand to translate it to paper. 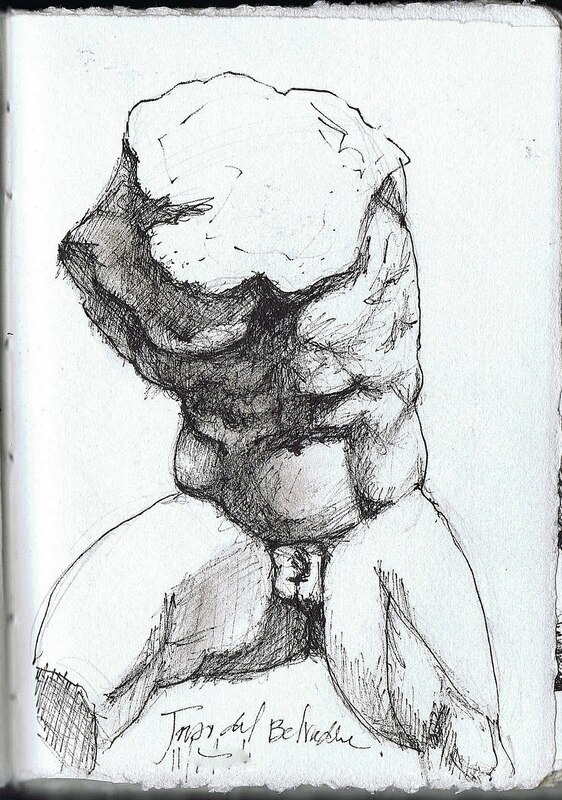 Many of my drawings are left unfinished (like the Schiavo above and the Torso below), this is because I stay at museums until closing time, which is usually before I am finished, or rude tourists elbow me out of the way so they can take pictures; more often however, these seemingly unfinished drawings represent studies, autodidact attempts at a new technique or a new understanding, like the drawing of the Dying Gladiator that I posted in The Challenge . Drawing from Michelangelo, Bernini, or the ancients, for example, has taught me not only about the beauty of the human body, but also about movement, strength, tension, and the intricacies of shade and shadow. After "Il Torso del Belvedere" Vatican Museums. Rome, Italy. Ink on Amalfi paper. Nadia Palacios Lauterbach. After Titian's "Wisdom. Biblioteca Marciana. Venice, Italy. Oil on canvas. Nadia Palacios Lauterbach. All this "studying from the Old Masters", all this exercise and discipline have had a great impact in my daily work; I have become keenly aware of detail, of composition (even on wall sections!) of perfection. These skills allow me to organize my ideas into designs with a facility that no SketchUp or Revit can mimic. And while computers are great tools (which I also use every day) with which one can create photo realistic renderings, there is no substitute for the human brain and hand, and humility apart, many people can click away but not every body has the skills to do what Mr. Borson and I can do. 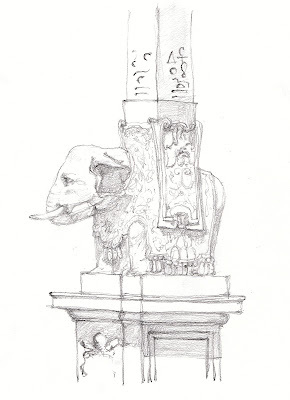 Design for a modified "Tower of the Winds" capital. Pencil on vellum. NPL for Curtis and Windham Architects. Proposal for a new residence in Houston. Magic markers on vellum. NPL for Curtis and Windham Architects. 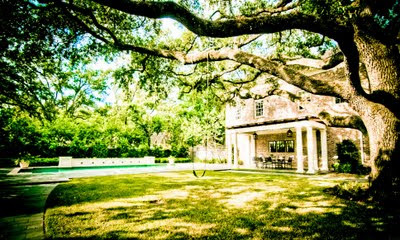 Proposal for the restoration and alteration of a Houston family's 100 year old stables. Magic markers on vellum. I would say to the high school students who want to study architecture but think they can't draw, that they should remember how the great monuments of Architecture were created by individuals whose first contact with the art of building was by drawing, and if we intend to follow in their footsteps we should apply ourselves in equal fashion, whether through school curriculum or private discipline, to the rigours, challenges, and rewards of drawing. 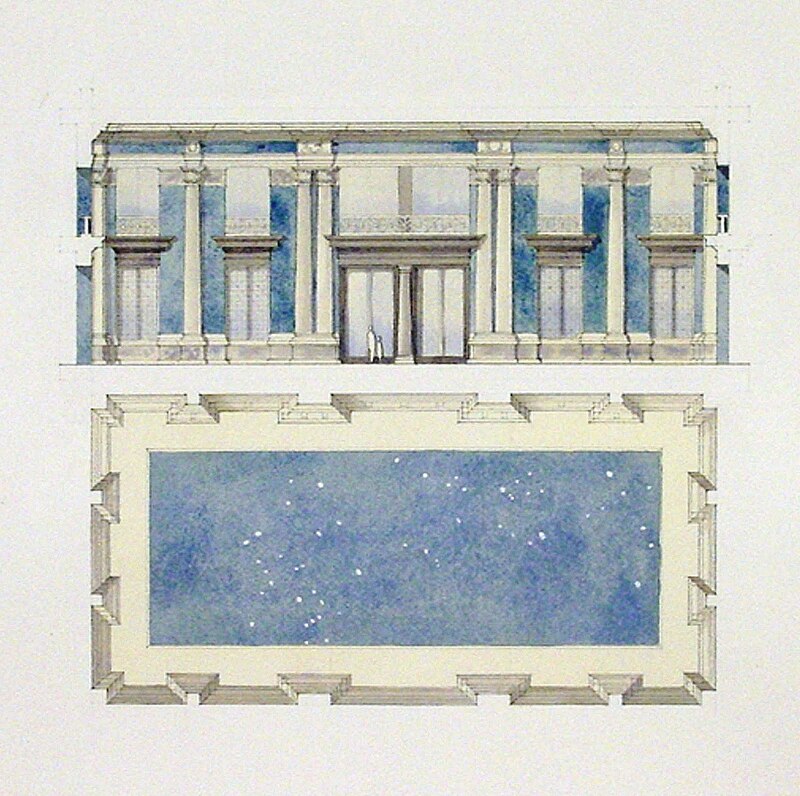 Proposal for a new garden and garden Loggia. Houston. Magic markers on vellum. Nadia Palacios Lauterbach. 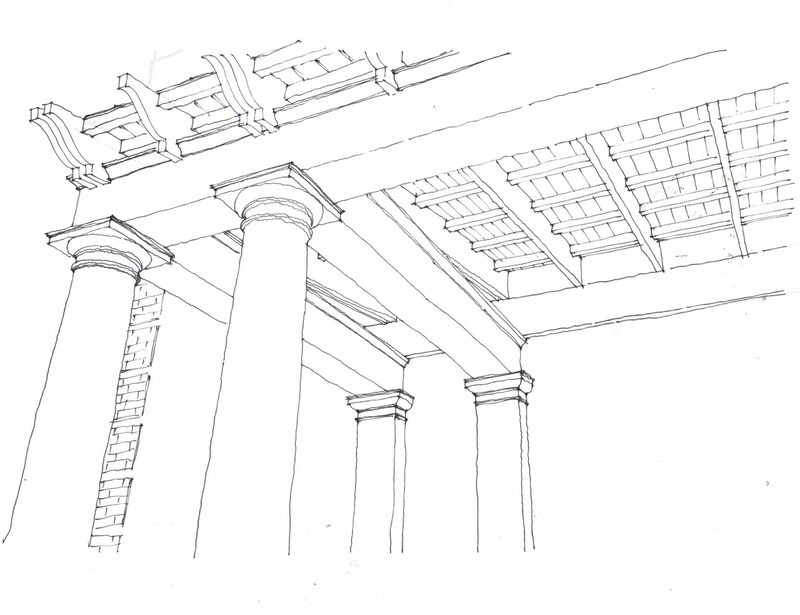 Pergola Ceiling Study. Ink on vellum. Nadia Palacios Lauterbach. 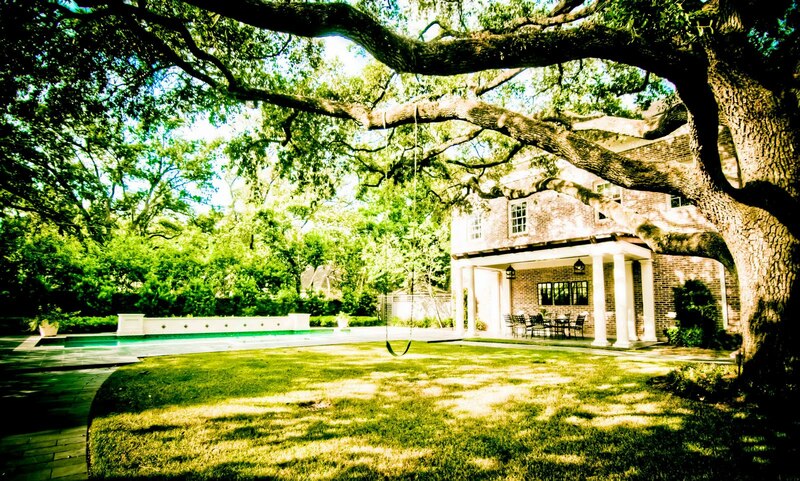 A new garden in Houston. Nadia Palacios Lauterbach. Drawing is an excellent tool to help us see. When we draw in the field, we unknowingly analyze massing and appreciate the minutest of details that may be easily ignored while passing by or glancing at a photograph. 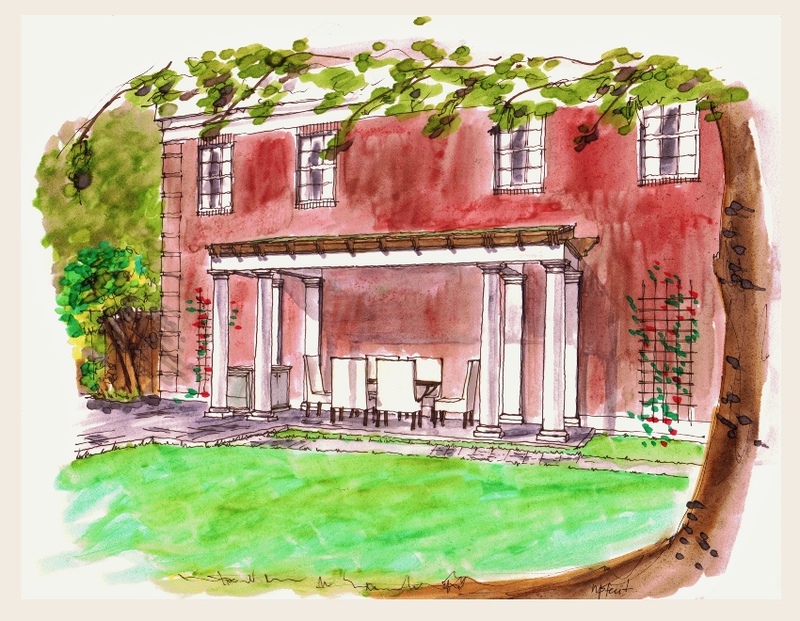 Drawing is an integral aspect of a solid architectural education and practice. It may even help you explain something to a client in a meeting when words are not enough to convey your ideas. VERY interesting post! I have to share more with your when we're both in the office at the same time. Such a fascinating and informative post which we have greatly enjoyed reading. We too should argue the case for drawing to be part of the tools of trade of an architect. 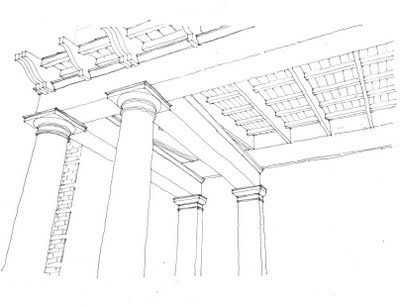 Drawing is, in our view, a disciplined relationship between hand and eye and, when in harmony, shows an understanding of scale and form which are essential elements in successful architecture. Words are inadequate in our view to express these intricacies of shape, balance and style and drawing is the only medium to offer an acceptable resolution to the challenge of conveying this information unambiguously. Another great post! Drawing has so much to do with observation - much more than creativity. If one can observe and reproduce, one can draw. Great post! I agree with you that drawing is mostly about practice. But I also have to agree with Bob Borson, when he states that, in order to be an architect, you don't have to be a wonderful or very skillful sketcher. Though it sure helps if you can express your ideas by drawings. And I agree with you that drawing is not on its way to extinction. CAD and other devices will never substitute the initial, explorative drawing (at least not for me).